When automaker Mini wanted to market its new brand, it knew it needed a marketing vehicle as iconic as its unique cars. The key objective of the campaign was to target a group of specific prospects and deliver personalized materials to start them down the path to purchase. 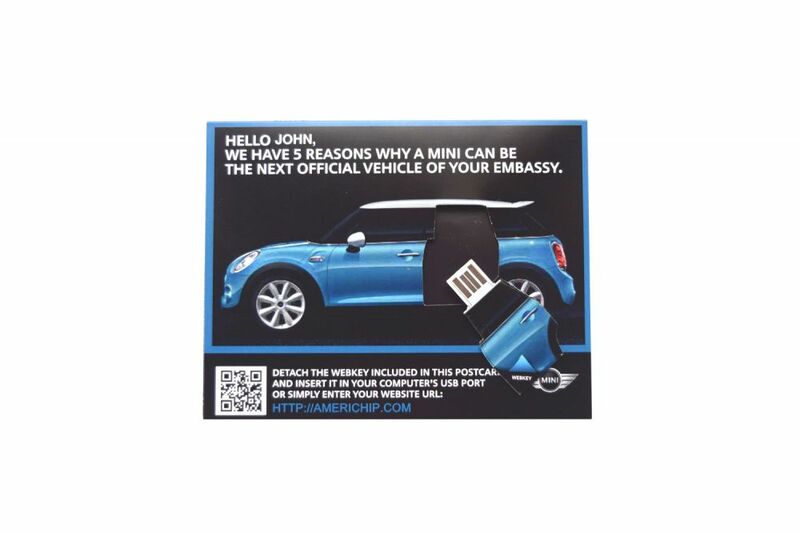 Americhip worked with Mini and its Ad Agency to design and produce a simple postcard mailer in the shape of the new Mini 4-Door that delivered Americhip’s Webkey technology. 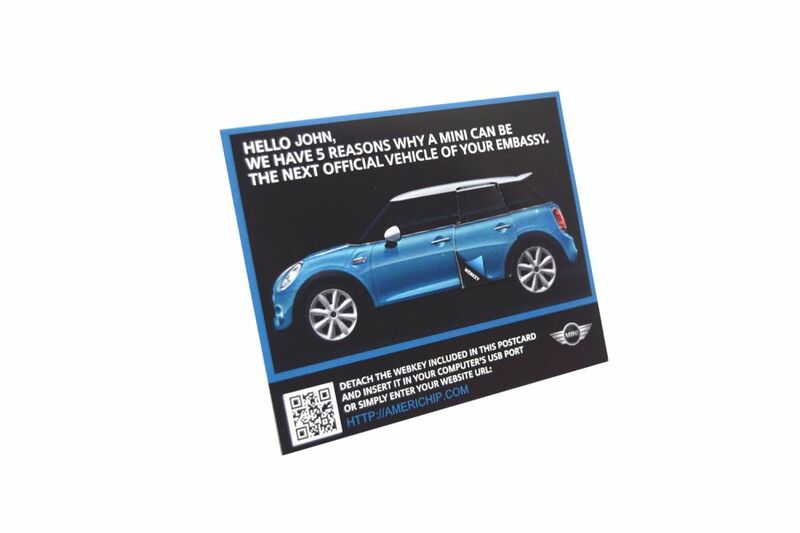 Americhip’s Paper Engineers designed the Webkey to fit as the rear door of the Mini. Recipients “opened” the rear door to remove the Webkey. Each card is personalized with the recipient’s name and an image of the new model. More impressively, Americhip programmed personalized URLs onto each Webkey so recipients are taken to pre-determined landing pages designed just for them. 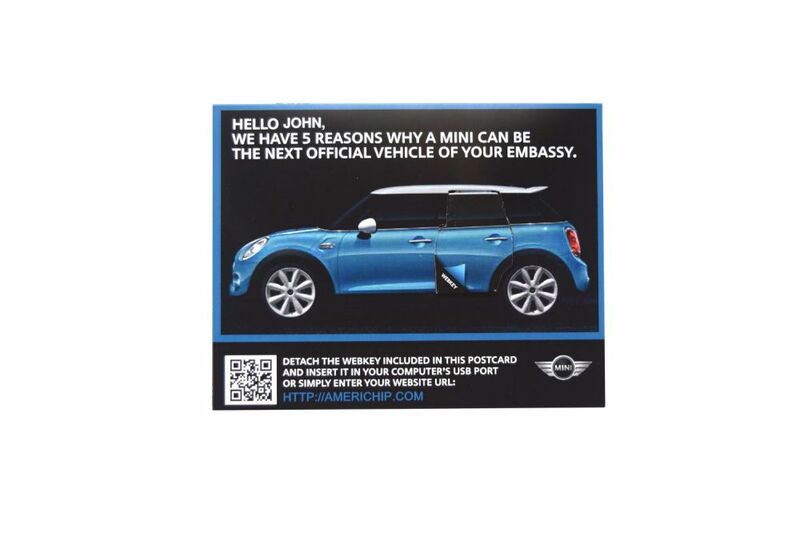 Given this personalization, Mini could track interest and activity by each recipient. Clever execution with real ROI/ROO. Put Americhip’s Technologies to work in your next campaign for better consumer engagement and performance data.